Named for Joseph Asscher who founded Royal Asscher jewelers, the distinction of an Asscher cut diamond rests in its history. As the birth of the design began near the turn of the 20th century, now existing for over 100 years, the Asscher cut exudes timeless elegance and evokes images of high society betrothals between the wealthiest and most privileged families. An Asscher design appears sleeker and elicits more subdued sparkle than the star-like designed facets found in round brilliant and princess cuts. The Asscher cut resembles a square version of the classic emerald cut, and, originally, both the Asscher cut and the Emerald cut each bore 58 facets. Today’s modern Asscher design, however, features 74 facets. While the Asscher cut subdues the stone’s spark, the intricacies of the cut make the Asscher the little-black dress of diamonds. Nothing overwhelms an Asscher cut. Every additional detail makes it more beautiful and compelling. The elegance and beauty of the cut has made the Asscher a favorite among celebrities and anyone who appreciates a diamond shape that harkens back to Art Deco luxury. A-listers who wear or have worn Asscher cut engagement rings include Gwyneth Paltrow, Jessica Alba, Vanessa Bryant, and Reese Witherspoon (from ex-husband Ryan Phillippe). 1. Add a halo of stones. While an Asscher may stand alone brilliantly, a halo of diamonds surrounding the stone induces a spectacular sparkle. The remarkable beauty of the cut becomes even more pronounced when paired with a halo of round brilliant stones. Check out this Custom Halo Setting in Platinum. 2. Choose white gold or platinum. A setting makes all the difference in how a stone shines. The mirror-like quality of white gold and platinum provide a reflective background for the stone, setting off the Asscher’s detailed facets and depth. Use side stones featuring diamond shapes like princess or the triangular trillion shape. Cuts that are square or triangular nudge against the Asscher and provide a flattering contrast, adding sparkle and interest to the ring. For more ideas, check out our article The Best Side Stones for Asscher Engagement Rings. Like the LBD, the Asscher’s versatility makes the cut a fantastic choice to play with bolder choices in a ring like colorful side stones or a gemstone halo. Adding trillion colored gemstones against an Asscher highlights the beauty and details of the diamond. Sapphires or emeralds encircling an Asscher turn the stone into a work of art. 5. Dozens of diamond details. 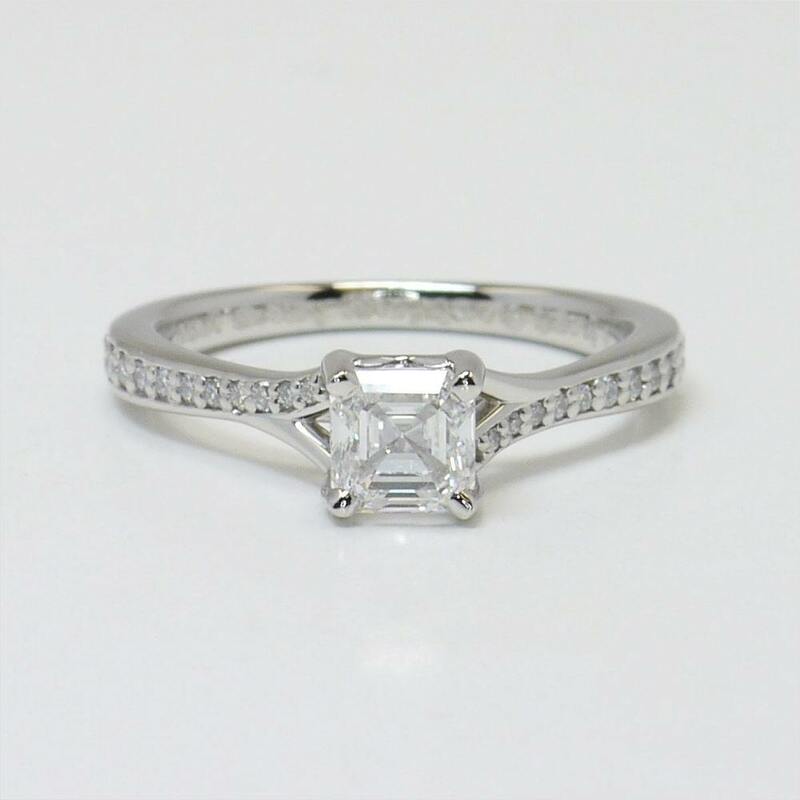 Add channel set diamonds or rows of pavé diamonds on the band to surround the Asscher completely. There can be no such thing as too many stones around an Asscher—the more the merrier. More diamonds simply add more life and light. A setting that features an Art Deco engraved design perfectly coordinates the Asscher’s high society history. Engravings within the band help the sleek design of the stone take center stage, and an engraved band also helps add simple sparkle to the ring. An Asscher cut diamond stands alone in elegance and sheer sleek beauty. The intricacy of the cut makes the stone appear less fiery, but the Asscher’s complexity simply means that the cut can carry more details while still maintaining a dignified air of wealth with every added diamond detail. Asscher diamonds are truly a cut above the rest.